Bangkok, 3 January, 2018 – Dusit Thani Bangkok will now remain fully operational until 5 January, next year, instead of 16 April of this year, as was previously announced. The hotel’s closing date has been extended to allow Dusit and its partners more time to add even greater value to the new version of the hotel, which will open as part of a 36.7 billion Baht (US$1.1 billion) landmark mixed-use project to be built in partnership with Central Pattana. Founded by Thanpuying Chanut Piyaoui and opened on 27 February 1970, Dusit Thani Bangkok was once the city’s tallest edifice and largest hotel. A new landmark for the capital, the hotel pioneered five-star hospitality inspired by authentic Thai values and ushered in a new era of tourism for the city, revolutionising dining, entertainment and even the way people organised wedding receptions in the process. I would like to say a ‘Warm Welcome’ to everyone who lives in Thailand and those who have travelled from various countries. As the host country, I hope you will have a great time in Bangkok. This vibrant capital has a lot to explore for business and pleasure. Moreover, it is a great honour that the Tourism Authority of Thailand has been selected to be a keynote speaker for this conference since ISO is renowned as an international organisation and entrusted by the public and private sectors all around the world. I am delighted that it has also placed marketing and communications as one of the vital issues nowadays. So, what is TAT doing for marketing communications? Of course, Amazing Thailand, which most of you might be familiar with. It is a part of my work. Another job, which is a very important one, is to deal with crisis communications in order to minimise the impact on the tourism industry including our stakeholders and tourists as well as to enable Thailand’s tourism to bounce back within a short period of time after a crisis. However, today, I am going to focus on the communications side, and how we implement it to build the country’s tourism industry as well as what we are doing now to keep up with the fast-pacing world driven by social media. Before we start, I would like to provide you a background what TAT is and what we are doing. Our responsibility covers two main parts: marketing and communications including advertising and publicity for tourism domestically and overseas. Due to a large market to take care of, we have 38 TAT local offices countrywide plus the Head office in Bangkok and 27 international ones worldwide to keep abreast of our customers’ trend and behavior. We are going to expand our overseas offices to Toronto in Canada and Sao Paulo in Brazil soon. When it comes to the communications side, the work of the Head Office is not only about producing initiatives or promotions, but making it stay united, unique, and create an impact on the audience. Meanwhile, the significant thing is to make sure that the main message delivered to all markets is not confused. Our overseas offices will also work under our communication umbrella to adapt for their in-market audiences, which depends on their preferences and behaviour. To know who TAT’s customers are will lead us to build the right content and tool to approach them. Looking at last year’s international figures, Thailand welcomed around 32.5 million tourists worldwide, which generated the tourism income of 42 billion US Dollars (1.6 trillion Baht). As you can see, this is a large number of tourists, which means a great range of diversity in terms of demography. Consequently, it is essential to identify and know your customers. What is more important is to single out your future ones. Now, besides niche markets; such as, weddings and honeymoons, health and wellness, and sports tourism, TAT has been eyeing on new segments of tourists; namely, the young generation of Gen Y and Millennials including you in this room influenced by digital and social media. Meanwhile, we have still maintained our emphasis on our mainstream travellers. So, it is vital for us to design the right content, right tool for the right group of audience at the right time. This has enabled us to communicate with them in two ways. Firstly, online is created for emerging customers; such as, Gen Y and Millennials according to their frequent use of the Internet. In addition, it is good for the niche markets, while offline has still retained its role to engage with the general public. For example, we continue to work with various leading global media as well as travel magazines to spotlight Thailand’s destinations among the public interest. As I have mentioned, TAT supervises both domestic and international markets, and our communication strategies have been separated to fit with those accordingly. So, today, I would like to emphasise on the international market only. In 2018, we will implement the marketing communications of ‘Open to the New Shades’. This is not the first communication initiative in the past few years, but we have done many campaigns several times to fit with the changing trend of the world. Despite a lot of changes, it has been pointed out that the ‘Amazing Thailand’ campaign has been most recognised worldwide and counted as the most successful. So, we decided to implement it as a brand, but redesigned the new key visual in 2016 to make it more modern, lively, and fun. What makes the ‘Amazing Thailand’ brand so strong and powerful? The answer is clearly seen in our logo. It is the Thai smile, which refers to hospitality or friendliness. Among pristine beaches, tasty food, or charming culture being ranked as the top reasons, we do realise that ‘Thai people’ count in those memorable moments to travellers in addition to ‘Thainess’ that set the holiday here like nowhere else. So what is “Open to the New Shades”? This concept reflects another kind of “Thainess”, which is the unique characteristic of the Thai people to welcome visitors from all around the world. Hence, we are promoting a genuine form of true “inclusive tourism”, which is especially important in this day and age. The future of tourism will lie in the ability of everyone to design their own happiness, especially the emerging generation of young millennials. What could be more fun than designing your own trip with a personalised selection of “Mix and Match options” That means you are designing your own happiness. The “Amazing Thailand” brand gives you the opportunity to design your happiness all the time wherever you go in Thailand. So, you will see from the key visual that the font imitates the line of brush strokes. This refers to the individual handwriting of travellers when they write their own travel journal or postcard. This supports the idea that travellers can personalise their own journey. This new concept will be customised to accommodate every single target segment and market; such as, Luxury, Weddings and Honeymooners, Lady Travellers, Families and Gen Y. We believe that the differences and varieties of “Amazing Thailand” can be found everywhere in the Kingdom. Visitors can discover new perspectives in existing attractions, or indulge in experiences in new tourist attractions. Each pagoda, temple and figure has a variety of patterns and shapes that change in line with their origins, roots and local beliefs. From this concept we will look into the tourism products under this campaign. We have potential tourism products reflecting this; such as, Gastronomy, Nature/Beach, Arts and Craft, Culture, and Way of Life. You will definitely fall in love with our country and discover that Thailand is the capital city of gastronomy and famous for its cuisine, especially street food and fine-dining, which foodies can enjoy 24/7. And also the Michelin Guide book Bangkok will be launched on 6 December, and Thailand is considered as the fifth country in Asia that the Michelin Guide Book has taken part. Hat Sai Dam (หาดทรายดำ) in Trat province is a Black Sand Beach, which is one of five places in the world caused by an iron ore called limonite. Ko Wai (เกาะหวาย) is located 45 minutes away from Ko Chang in Trat province. The island has scenic beaches with soft white sand, an ideal place to swim, snorkel or simply relax and do nothing. Throughout history, the Thai Kingdom has developed various aspects that have come from the inspiration and imagination of the Thai people. These have resulted in the arts and crafts that can be seen nationwide today. Maiiam (ใหม่เอี่ยม) Contemporary Art Museum in Chiang Mai province. The Museum of Floral Culture in Bangkok created especially for lovers of flowers, nature and those with an interest in Thai art and culture – an important part of the Thai way of life. Lhong 1919 (ล้งnineteen nineteen) comes from a Chinese word “ฮวย จุ่ง ล้ง” literally meaning steamboats. This is an old port from the reign of King Rama the third’s reign, which has been restored as an open museum about Thai-Chinese history. And this is the new pride of the Chao Phraya River. Wonderfruit Festival is where visitors can explore the adventure of sustainable living, which is built on six pillars of arts: farm to feasts, music, wellness and adventures, talks and workshop, and family. Our traditional culture has a variety of outstanding facets that are unique to Thailand, and are reflected in our religions, sports, dramatic arts, etc. Wat Muang (วัดม่วง) in Ang Thong province houses the largest sitting Buddha image in Thailand surrounded by paddy fields with the massive image dominating the area. Wat Rong Sue Ten (วัดร่องเสือเต้น) also known as the Blue Temple is a colourful, but peaceful temple located just north of the Kok River in Chiang Rai province. To enjoy a real Thai life experience, the only way is to come to Thailand and live like a local and act like local, and these experiences can be found in every region of the country. Ban Rai I Arun (บ้านไร่ไออรุณ) in Ranong province is a kind of interesting activity that will offer you the real experience of the Thai way of life. Night Markets especially during the weekend where visitors can go out for dinner or shopping, or just get together with friends in the evening. Street art that fulfills the colour of the community around Charoen Krung Road is what you can explore while on your bike. In fact, the strength of our branding has also been built by customers themselves. This has been attested that the tourism industry has performed well with the growth of 7- 9 percent under this situation. Therefore, to create the consumer-focussed brand is to maximise the customer’s engagement with us. Keep them to be a part of our brand and that is when the customer’s touch point is created. This has led us to an inventive concept to ‘Cloudsource’ the real footages from travellers worldwide to make the promo for ‘Open to the New Shades’. So, the interactive campaign has been invented to encourage tourists to join in to trade their footage to win a prize from Thailand according to the preference in that market. We let travellers tell the story themselves and share their stories with others. With such a campaign, we think that “Open to the New Shades” will make Amazing Thailand stay closer than ever to the customer and offer them a new experience that they will have never had before. The brand that can get closer to customers most is regarded the strongest. Here is the key. This also accounts for the reason why the brand ‘Amazing Thailand’ has still been long-standing and had an impact in the tourism industry. It is not only because of TAT, but also the contribution of our visitors. How we evaluate the success of the communications? One of our concrete successes is reflected through the growth of the tourism industry every year. Last year, the tourism revenue increased by 13 percent over 2015. It also reinforced the significant role of the tourism industry on the GDP to drive the national economy. When looking at its direct contribution to the national business sector in 2016, tourism accounts for 2 percent of the total GDP, equivalent to 36.7 billion US Dollars (1.29 trillion Baht), and it is forecasted to rise by 9.3 percent in 2017. According to our research of interviewing international tourists, ‘Amazing Thailand’ could create brand awareness up to 53 per cent. In addition, Thailand has become a strategic partner especially with many more leading international airlines; namely, Qatar, Etihad, EVA Air, Singapore Airlines, Emirate, and Turkish Airline, This has reflected that the potential of the destination itself is recognised by those partners. It is also strong enough to encourage their passengers to travel to them. As I have said that our brand has been known for quite some time, so we will let the travellers around the world speak for us and share the message to others. And finally, they will become the ones that will make the brand survive. To wrap up all what I have talked about today, we will show you a sample of the ‘Open to the New Shades’ VDO. To summarise, in order to make any communication successful, the key question is ‘Who are your customers?’ and especially ‘Who are they in the future?’ It will lead us to serve their need at the right time in the right way most effectively. Moreover, ‘sharing culture’ will increasingly influence on the customers’ behaviour. As the world will be all connected and driven by digital things, content, and taste, trends from the other side of the world will be shared and acknowledged to the others with just one click. When the tourism community has become one, what matters is what should we do to keep ahead and stand out from others? Bangkok, 3 January, 2018 – Thailand’s strong positioning as the MICE hub of ASEAN is being strengthened with the opening of The Banquet Hall At Nathong, the newest and most comprehensive multi-purpose convention and seminar centre in Bangkok’s new CBD area. 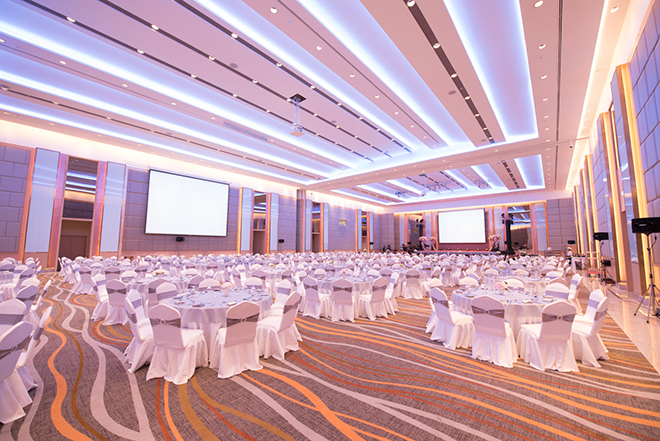 The 2,000-square-metre, 8-metre high ceiling Banquet Hall at Nathong can handle 1,800 guests and can be divided into three function rooms. The hall is well appointed with a versatile foyer area and beautiful landscaped gardens. In addition, there is one executive meeting room. Facility includes audio-visual display, a wide range of food and beverage options, free Wi-Fi, and shuttle service for group customers from/to Huay Kwang MRT Station. 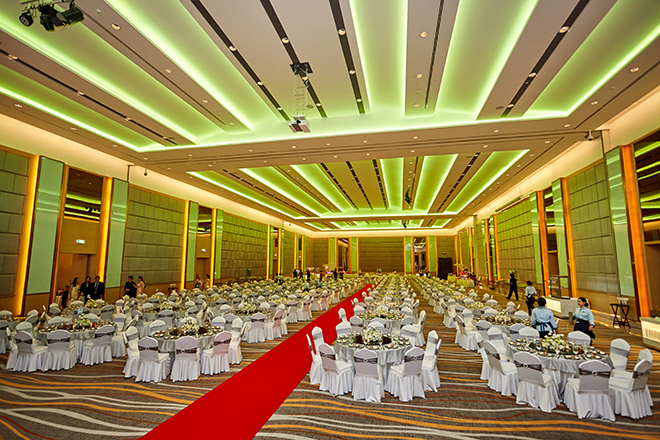 The Banquet Hall At Nathong is situated on Pracha-uthit Road, near Mengjai Intersection, and about 10 minutes away from Huay Kwang MRT Station. The sale of ivory just became illegal in mainland China, a move heralded by conservationists, who say the legal trade has been providing cover for its illegal counterpart, perpetuating the belief it is okay to buy and own ivory. China announced the ban at the end of 2016 and put it into effect at the end of 2017, surprising those who thought it might take up to five years to go into effect. Conservationists are optimistic, although they say it is too early to predict how it will be enforced. Save the Elephants CEO Frank Pope believes the ban could prove “transformational” for the fortunes of elephants, but he cited one caveat. Like his conservation colleagues, Philip Muruthi, vice president of species conservation at the African Wildlife Foundation, also praised the ban and noted the importance of preventing the market from shifting to other locations and helping preserve endangered species. But he said elephants will not be the only beneficiaries. Conservationists say while combating poaching is critical, one of the bigger threats to elephants in the long-term is habitat management. They urge African governments, and China, through its support, to help reduce the threats.